The constitution of India provides the elaborate list fundamental rights for the citizens of India, so as to protect them from the over jealous elected governments from time to time or from any other individuals. The State is thus prevented from making any law that takes away or abridges the fundamental rights of the citizens. If any Government tends to make such legislations that prevent the fundamental rights to the people, the courts can declare them as unconstitutional. Even the democratically elected rulers of the nation cannot unleash any embargo on the peoples’ rights and the safeguard comes from the Articles 12 to 35. 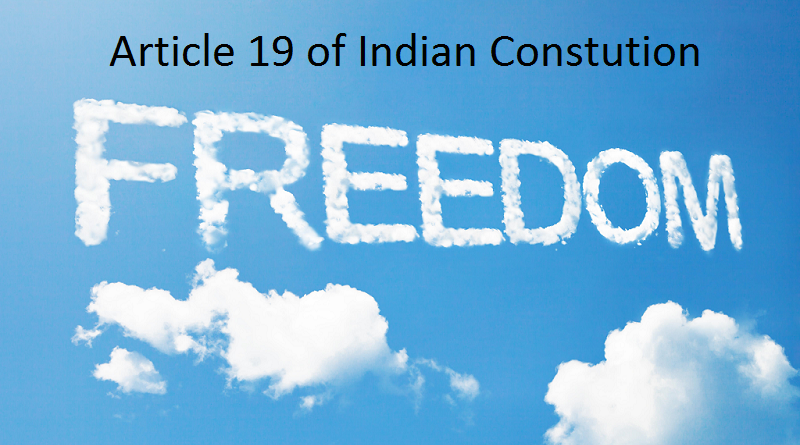 The Articles 19 of Indian is very special in nature since it talks about the freedom of expression, the vital backbone of the democracy. This implies that the citizens are free to express their views, beliefs, and convictions freely without inhibitions by the word of mouth, through writing, printing, pictures or any other manner including the devices of electronic, broadcasting, and press. The Right to Information (RTI) emerges as a right under Article 19(1)(a). This provides the right to hold public meetings, demonstrations, and take out the processions peacefully unarmed. It provides a guarantee to all the citizens the right to form associations, and unions. Except in certain areas of the Scheduled Tribes and territory of the army a person can move from one point to another within the territory of India. An Indian citizen can reside in any state except J&K. The citizens can do any business or occupation anywhere in the country. The constitution originally guaranteed the freedom to acquire, hold and dispose of their property. But, the forty-fourth amendment dropped this freedom from the list. The freedom of speech and expression is restricted to some extent if it affects certain events / deliberations such as the security of the State, friendly relations with foreign countries, public order, decency or morality, contempt of the court, defamation, incitement to violence and offence against the sovereign integrity of India. Likewise, the right to assembly is also restricted in the interest of the sovereignty, integrity and public order. Any assembly even to highlight any grievance should be peaceful. Any such assembly should not disturb the unity and sovereignty of the country. The power conferred upon the State Government under section 144(6) of the Criminal Procedure Code against the unlawful assembly of five or more persons is constitutionally valid, according to a judgment of the Supreme Court. The right to form associations or unions is also restricted in the interest of the public order, morality, unity and integrity of the country. The right to free movement throughout India and residing in any part of India can be restricted in the interest of the public and the Scheduled Tribes. The freedom of the profession can also be restricted in public interest, the mandatory requirement of the technical or professional qualifications, and in cases of the State deciding to engage in any trade or occupation. However, the restrictions are subjected to judicial review from time to time in the courts so as to decide the suitability of these restrictions imposed to ascertain whether the restrictions are reasonable or not. The forefathers of the constitution wanted the restrictions to be reasonable, which are tested in the courts during the proceedings. The Constitution of India does not specifically mention the freedom of the press, which amounts to say that the freedom provided to the press is not lesser than the freedom provided to the individual. It includes expression of opinion through websites and blogs also in modern times. It is an inferred right implicit under Article 19(1)(a). However, the freedom of the press was restricted during the emergency in 1976 by Article 352 and it was almost practically abolished till the freedom of the press was restored after the demise of the emergency. It is to be noted that the constitutions of the other countries like Britain and USA do mention the freedom of press separately and significantly. Article 19 of the Indian Constitution is a significant provider of the freedom of speech and expression, without which the democracy will become just a mockery and a puppet in the hands of the elected government, as people, opposition parties, and press may not come forward to critically examine the measures adopted by the elected governments. truly appreciate your efforts in this regard. would love to read more articles on general studies.